This page will almost certainly not be the first or last word on the subject of The Philadelphia Experiment. What it will attempt is to give readers some idea of the scientific basis that supposedly extended into this experiment and beyond into the field of time travel, and examine the philosophical principles that inform the way that we perceive and understand strange phenomena, and that inform our choices in determining what to do in given situations. As ever, human social growth in how we deal with this type of phenomenon is even more important than the technology. What was The Philadelphia Experiment? Basically this was an early stage of the development of modern stealth technology, concerning a wartime effort to make a U.S. Navy ship primarily invisible to radar, secondarily invisible to the human eye, and as the story goes this inadvertently led to a third level that included eventual removal of the ship from normal space-time altogether. Subsequent developments included a study of the electromagnetic potential of the human mind and opened the doorway to time travel technology. Scientifically speaking, the Philadelphia Experiment was largely electromagnetic. The relationship between electricity and magnetism can often be most easily summarized by various "left hand" and "right hand rules". 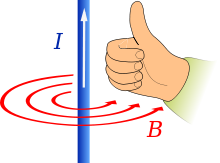 Going back to the simplest form of these, if you make a fist with your right hand and stick your thumb out, then imagine that you have a flow of electricity in the direction that your thumb is pointed in, your curled fingers will accurately represent the direction of rotation of the magnetic field that is associated with that electrical current. Any time electricity is flowing, there will be a magnetic field associated with it, and vice versa. The geometry of this relationship was first discovered by a Danish physicist named Hans Christian Oersted. This most basic property was later embellished and made practical by Nikola Tesla, who created the standards for the types of electric motors in common use today, which demonstrate this basic relationship. As electricity is applied, it creates a magnetic field. Specially constructed coils around the motor cause it to begin rotating in the direction of the magnetic field, and that rotation can then be applied to do work such as drilling or turning the wheels of a mechanism or vehicle. It also works in the other direction. Water turbines or windmills are made to rotate, and when those rotating parts are carefully constructed with coils of certain metals, the movement creates a rotating magnetic field, which generates electricity. The implications of this simple principle become clear when you look at modern "string"-based versions of the Unified Field Theory, which are based on the idea that the universe contains 9, 10, or 11 dimensions (depending on which version you look at), some of which we can perceive, others of which are abstract. An event along one dimension can affect events in two other dimensions, through electromagnetism, in ways that almost appear magical. What other dimensions can electromagnetism access, or show us how to access, if harnessed in the correct pattern? It is interesting to note that some of the same groundbreaking physicists and inventors who made advances like electromagnetic motors and power transmission systems work practically in the late 1800's and early 1900's did not end their research there. Advancements in knowledge and applied electromagnetics continued until some of these same people were working on projects like The Philadelphia Experiment, where massive amounts of electricity created very specifically patterned magnetic fields that reportedly actually bent the space time continuum. "That fellow Einstein suits his convenience. Every year he retracts what he wrote the year before." In a theoretical capacity, Albert Einstein was one of the brains behind the Philadelphia Experiment. After moving to the United States, he spent much of his time at the Institute for Advanced Studies at Princeton, where the theoretical background that led to The Philadelphia Experiment was first formulated. Einstein was able to bring to the project his background of dealing with the photoelectric effect, the speed of light, theories about the warping of space-time, mass/energy conversion, and his early work on a Unified Field Theory which was to incorporate electromagnetism. Another key player was Nikola Tesla, a renowned inventor who specialized in electromagnetism. His success in designing a generator to harness the energy of Niagara Falls and supply New York city with the resulting electricity without loss of power helped to get alternating current, or AC, adopted as a world electrical standard. His former boss and rival, Thomas Edison, had backed direct current, or DC, which consequently fell out of favour. "Over 700 patents were issued to Tesla worldwide. Among these, the Tesla Induction Motor is widely accepted as one of the ten most important discoveries of all time." ~ from the documentary "Nikola Tesla: The Genius Who Lit the World"
His continued experiments with electrical generation, magnetic field coils, and electromagnetic properties led him to direct involvement in the Philadelphia Experiment. Yet one more player is Dr. John Von Neumann, widely documented as the founder of the modern computer. "While consulting for the Moore School of Electrical Engineering at the University of Pennsylvania on the EDVAC project, von Neumann wrote an incomplete First Draft of a Report on the EDVAC. The paper, which was widely distributed, described a computer architecture in which the data and the program are both stored in the computer's memory in the same address space. This architecture is to this day the basis of modern computer design, unlike the earliest computers that were 'programmed' by altering the electronic circuitry." After a failed preliminary test in March 1942, which Tesla may have sabotaged out of conscience, Von Neumann reportedly replaced Tesla as the head of the Philadelphia Experiment project, inheriting the challenges of solving certain metaphysical personnel problems. Several factors were at work motivating the people and organizations involved. From the point of view of the earliest scientists involved, a spirit of discovery often eggs them on, as ideas come to them, and the question of whether or not they can actually achieve something like invisibility becomes consuming enough that they simply must test their ideas and see. A second most important motivation is that of the military during World War II - or any military in any war time situation for that matter. If you can get a technological edge on your opponent, it is very much to your advantage to do so. One of the edges America famously achieved on its opponents, making the outcome of World War II more decisive, is that of the atomic bomb. Things to note about this advancement include the fact that it largely worked the way it was intended, creating a tremendously big and ugly explosion in enemy territory. Also, the use of this device was clearly less ideal than the threat of using this device. All this points to the fact that it was within the military's best interests to demonstrate and advertise to the public at large, and thus to its enemies, that it had this advance and could use it anytime in future. The advantages of The Philadelphia Experiment and its extensions were of a different category. Invisibility, stealth, teleportation, and time travel are more suited to covert operations than overt operations. Plus the results of early tests were not without side-effects that would tend to embarrass those involved in terms of what was happening to many of their own people, or of what they wanted to try to achieve with some of these things. Secrecy for this project suited military and political motivation, and has made this project far less well-known than the atomic bomb and much harder to document. Much of the information that we have concerning The Philadelphia Experiment and subsequent projects comes from individuals who claim to have been directly involved. Al Bielek was a participant on the original Philadelphia Experiment, operating the generators on board the U.S.S. Destroyer Eldridge when it vanished on August 12, 1943. Another operator was Duncan Cameron, who subsequently went on to become a central figure in the inextricably linked Montauk projects in the early 1980's. Preston Nichols is an electrical engineer who was heavily involved in the Montauk projects developed from the results of The Philadelphia Experiment. There is a theatrical film that also tells the basic story of The Philadelphia Experiment starring Michael Paré (Starhunter, The Greatest American Hero). Though certain narrative liberties were taken and embellishments were added such as a love story subplot and additional trips into California to reveal personal backstory, the film still portrays many of the basic events of the Philadelphia Experiment itself and its bizarre tie-in with a related project of the 1980's. Roughly speaking, in terms of their actions related to the Experiment, you could slot Duncan Cameron into the role of David Herdeg (played by Michael Paré), while slotting Al Bielek into the role of Jimmy Parker, and Dr. John Von Neumann into the role of Dr. Longstreet. A long series of initial successful experiments preceded the final test. These showed that magnetic fields in specific resonance patterns could make objects invisible to both radar and the naked eye. In the largest of these successful tests, the navy was able to use two manned ships to operate and power the equipment that made a third unmanned ship tethered between the first two invisible. However, what was really wanted was a system that allowed a single ship to contain all the necessary power, equipment, and personnel to make itself and its crew invisible. The turning point in the fortunes of this fledgling technology came about when the effect involved living people within the bubble of electromagnetic field resonances. The human body has many critical electrical processes and electromagnetic fields of its own - some of which are collectively referred to as a person's "aura" in metaphysical circles. Not enough was known at the time by the top people of this particular project, in terms of how these natural processes might be hampered or interrupted or completely disrupted by the Experiment. On the final test of August 12, 1943, with a full crew aboard, the U.S.S. Eldridge was made invisible to radar and the human eye. There are reports that suggest the ship physically disappeared as well, and may have ended up traveling through a variety of different locations in time and space. It did return to the Philadelphia harbour that day, where it was soon realized that the Experiment had been a disaster for its crew. Some crewmembers were partially embedded in the walls and/or deck of the ship. Nearly all of them had lost their minds to some degree. The project was shelved for the rest of World War II, and later reassessed to find out what had gone wrong. Extensive studies were soon underway into the nature of the human electrical and magnetic fields, and how it related to mind, body, emotion, and spirit. Information from the original Philadelphia Experiment joined with research from other avenues at an old military base at Montauk point on Long Island, New York. Relationships between thought-forms and magnetic resonance patterns were discovered, to the point where these could be detected in people trained to concentrate their minds. The patterns could then be recorded in computers, amplified using massive amounts of electrical power, and the resulting magnetic resonance patterns broadcast via radar dishes to create space-time events such as materialization of objects out of "thin-air", or vortex tunnels to other locations in time and/or space. This reportedly used up massive amounts of power, which begs the question of whether or not there is sufficient benefit from its use to justify the expenditure. Montauk's major operations reportedly ceased in 1983. "Seek the source of truth, not the image of it." I discovered in my research quite by accident that I actually had in my possession the 2-hour video interview from which the earliest parts of Valerian's document were made, meaning it was now possible to identify some of his sources of information - none other than Preston Nichols, Al Bielek, and Duncan Cameron, all being simultaneously interviewed by about five or six other individuals in someone's living room. This video appears to be homemade, and has no official title that I know of. At one or more points the camcorder dates the recording as November 1989. I thought it would be interesting to feature information from Bielek, Nichols, and Cameron in a side-by-side comparison of my own personal transcription of the video beside the matching excerpt from Valerian's document, just to give readers an idea of how information like this can get skewed through the research/reporting process. More on that later. For now, just a note that not even my version is EXACTLY word for word, because: (1) sometimes four or more people are attempting to talk over each other, to ask questions, etc., and the words are not understandable, (2) sometimes people start a sentence, then abandon it as they think of an entirely better way of expressing themselves, (3) information often gets repeated either for emphasis, or because an audience member zoned out and asks essentially the same question again. Some kind of editing is practically essential to produce a document that can be read quickly and easily. "Next bright idea they got was, okay, let's tell Duncan to think of a vortex connecting, ahh..., 1981 to 1947. He would do this for them. What happened? They got a vortex going from 1981 to 1947 you could walk through. Great! Now..."
Audience: "Duncan had to be... You would have to be very good to be able to visualize, and...."
Nichols: "Duncan's very good at visualizing." Audience: "You would have to be... really an expert (master? ), I would think." Duncan Cameron: "A master (expert?) is a word in the dictionary." Audience: "It's the word I use." Preston Nichols: "What they discovered is: Okay, the real time, he thought of it. What they discovered is they recorded it, put the tape on the computer, it did the same thing again. So now, they had a tape that could open the vortex. And they started going back in time. They started going ahead in time. They actually got the time machine. That's the last phase of the Phoenix Project was the time machine." Audience: "They could control that time factor, to where they wanted to go?" Nichols: "Yup. Whatever he thought of" (pointing to Duncan Cameron) "or other people like him - he wasn't the only one. They had to have at least five back-ups." Audience: "That was still phase two?" Al Bielek: "No, that was phase three." Nichols: "It was the time machine." When did this time machine get going? Around 1979 or 1980 it was fully operational. This transmitter had enough power to warp space and time. The individual in the chair would have to synthesize the vortex function because they didn't have the technical capability to do that. It can now be mechanically synthesized. They did other things. They had the subject in the chair think of some creature, and the creature would materialize. They had the individual in the chair think of all the animals at Montauk point charging into town, and that's exactly what happened. They almost had the power to create a being. The problem they had was that what they created only stayed as long as the mind amplifier was on. The power was somewhere between gigawatts and terrawatts. Tremendous power. The vortex could have a diameter of about five miles. Audience: "Now the time machine, do you know the date?" Preston Nichols: "That got going about seventy-nine to eighty; they got that operational. Of course...."
Preston Nichols: "Yeah, about seventy-nine to eighty." Audience: "You could transmit both matter and thought-signals?" Nichols: "They had this - You could walk through the vortex! You could walk in in nineteen-eighty-one and come out in forty-seven." Audience: "Who? Cameron would, or...?" Nichols: "First of all, this transmitter was so freaking powerful; this transmitter had enough power to warp space and time. Go through Bearden's equations, there's more than enough power to do it." (pointing to Duncan Cameron) "He had the capability of thinking of the vortex function that they couldn't synthesize. They didn't know how to synthesize that vortex function. But he knew. Innately, inherently, he knew how to do it." Audience: Can it be mechanically synthesized right now? Nichols: "I'm sure they got the tapes. "There were also things they did was... they would have the subject sitting in the chair think of a creature and that creature would precipitate itself." Nichols: "That's what came out of somebody's mind precipitated through this huge mind amplifier. They almost had the power of creation. They could almost create a being. The problem they had is the being only stayed as long as the transmitter was on. Flip the switch, and the being stopped all its mobility and faded back into hyperspace. "But that's how powerful this thing was. This thing.... You're talking gigawatts, in the etheric power probably many many terawatts. You're talking astronomical etheric power. They're using multiple pulse modulators: pulse modulating amplifiers on top of pulse modulating amplifiers, opening different windows and driving this end to that end, and you can encode all sorts of zero-point functions as you go through what they call the amplidyne function. See, the amplidyne is essentially a zero-point amplifier. So by the time they started pulsing the 100 watt stage, by the time they got out to the... half a gigawatt output, the etheric power was up in the sky! This thing was tremendous! This transmitter, it took one... it took at times two generators supplying a megawatt each to run this thing! They were pumping two megawatts into this whole building, which you'll see pictures of. But, you know... I don't think I can overstate how much power... as far as we're concerned in this room, it's astronomical power this thing had. This thing literally had, if the target, if the person who was sitting in the chair thought of a time warp and a vortex, that vortex would form." Audience: "You said people could walk through this time vortex." Audience: "Did you ever walk through this time vortex?" Audience: "Do you know anybody that did...?" Audience: "Could you describe at least the experience?" Al Bielek: "I can. I did more than once. And it's... it's weird..." (smiles, audience chuckles) "...to say the least. The recollection is that you...."
Audience: "First of all, how is it formed? Just at the beginning, before it's created. What do you see?" Bielek: "Before it's created you see nothing but the building or the area that you're in." Audience: "You're in a chair, or an open space...?" Nichols: "No, what they finally ended up doing was they took whatever Duncan or his alternates would generate and they put it on tape." Bielek: "You could generate it inside the underground area, or you could generate the...."
Nichols: "From anywhere to anywhere, anywhere in space and time." Bielek: "...generate it outside. It could be from any particular point where they chose to generate the origin, and it would go to the terminal point." Audience (after 3 other overlapping questions): "Where?" Bielek: "The terminal point would be wherever they chose it to be." Audience member: "The future? The Past?" Audience member: "And you could be driving a car? I mean, what would happen if you were driving a car?" Nichols: "Your car'd go through it!" Bielek: "If your car went into the entrance of it, yes, the car would go through. And come out at the other end wherever it was. It could be a hundred or a thousand or a hundred thousand years in the future or the past. Whatever went in at the beginning or the entrance would come out the other end." Audience: "Could the car be spatially dislocated; could it be somewhere else in the universe?" Nichols: "I've run computer modeling based upon calculations I've learned from the radiosondes and such, and the vortex could have a diameter of five miles. Could be a five mile opening. Or of course they could bring it down to..."
Audience: "You could send all of Long Island!" Can you describe what this looked like? Its like looking into a peculiar spiral tunnel which was lit up down its entire length. You would start to walk into this thing and then suddenly you'd be pulled down it. You didn't walk through it as such. You were more or less propelled through it. You could go anywhere in space and time. Audience: "So what was it like, Al? You were saying..."
Al Bielek: "It's like looking into the entrance of a peculiar spiral tunnel which was lit all the way down. You would start to walk into this thing, and then suddenly you'd be pulled down it. You'd more or less be projected. You didn't walk through it as such. You were more or less propelled through it." Audience: "You walked into it." Bielek: "You walked into it, correct, to start. Then you were propelled down the thing like some force grabbed you and pulled you through, and you come out the other end wherever it is. You could be far in the past; you could be in the future. You could be very close by, and it could definitely be another place physically other than the point where you started, and usually was." Nichols: "Wherever the trans- ...whatever point in space and time the transmitter was set to transmit to..."
Bielek: "Emphasize space and time because it could be anywheres in the universe." Audience: "You could go back or forward in time?" Could you bring things back? Have you ever brought anything back? Audience: "Were you physically there? Could you interact with other things?" Audience: "You could take remnants back with you? Like, for example, if you projected yourself to go to another planet, you could bring something back with you?" Nichols: "If you could live on the other planet." Audience: "Has that been done do you know?" Bielek: "Right, ahhh... I can't answer that for certain, but I would say probably." Audience: "Have you ever personally brought anything back from another time, either from the past or future?" Audience: "Was it of terrestrial origin, or...?" Bielek: "Yes. In this case, it was terrestrial origin. It was a Life Magazine from the year 1983. I take it back to 1943, but that's part of the Philadelphia story." Nichols: "That's still continuing the Phoenix Project." Could you continue your description of the tunnel? Yes. The walls were solid but fluted. The tunnel was not straight but was a sort of corkscrew shape. Audience: "The description of the vortex... please continue." Bielek: "They were solid, but they were... fluted. It was not a solid bore through rock, as you would think. It was a fluted sort of structure. And you would go down this, and you would go... be propelled down this tube, as it were, this tunnel, which was not straight. It was corkscrew. And it would not go in a straight line either; it would take some very strange turns, which I could not explain. But it did take turns, and you would come out at the other end, wherever you were supposed to come out. And meet somebody or do something at the other point." Audience: "Did you have like a mission?" Bielek: "Yes. And you would return. Whenever whatever you were doing was completed. The tunnel would re-open for you, and you go in the other direction, you walk back in it, and go back from wherever you came from." Nichols: "Exact reversal of what happened when you went there." Audience: "If someone switched off the power...."
Did they ever give you a weapon in case you ran into anything negative? They didn't have to do that. The vortex could be arranged to follow the person, so that they could bring them back in if anything went wrong. They could see them on a viewer. Audience: "Were you ever given anything to protect you against anything you would come across, if it was a life and death situation? Because, people go into the jungles and they have weapons, let's say, or you're on a mission; you have weapons. But you would go into the future... if you met something and you were really in danger, what would you do if you didn't have a weapon of some sort?" Male Audience member: "Did they give you... did you carry such a thing?" Female Audience member: "Or would you have immediate access to the portal?" Duncan Cameron: "I have no, uhh, information on that. I can't access..."
Preston Nichols: "Okay, I think I can answer that. First of all, they could design the vortex so it would follow him, and they could essentially view what's happening to him in the future." Audience: "Ohh! They were viewing him!" Nichols: "That means... This... This I do remember, I'm sorry. This I know happened, that they could follow the person in the future or the past. Anything dangerous started to happen, they just bring him back automatically. It was like a mission control where there was a group of people watching what went on and they were able to talk to him. He could talk back to them. You know, they had it set up so that when they speak into a mic' on the station, he could hear it. And of course they hear what he says through speakers on the station. They had a whole monitoring set-up operational, and they also had the capability with the transmitter to run the vortex right over him and pull him back without him walking in it. They "walked" the vortex to him. And if he started to encounter anything dangerous: "Zooop!" He'd be pulled back, and he'd be out of it." The most notable aspect of Valerian's version is that it is made to appear as though all information is coming from one congruent source, rather than a group of people who may all have slightly divergent perceptions of what happened. This is a great shame, because in the difference between one individual and the next lies the strength of corroboration, and the checks and balances of disagreement. These are people of different character and personality, different areas of expertise, looking at a shared experience with different philosophical viewpoints. Understanding these filters for the information is often just as revealing as the information itself. It's also interesting to see how some of the ideas at times actually came more from the audience than the three interviewees. For those who wish to read the entire document, note that the question "Any initial comments about electromagnetics?" pretty much signals the end of the Nichols/Bielek/Cameron video that I can corroborate, and moves on to information taken from other sources, whatever they may be. If there is truth to the idea that humanity has already dabbled with time-travel and teleportation, what are the implications? What should we attempt to do with such technology? What could we learn? Since there is a time loop between however far you went back in the past through however far into the future, is everything fixed? Audience: "But the philosophical question is valid. I mean, where you would go back in the past, could you alter the future?" Audience: "Has it been done?" Nichols: "That's the reason we exist in a time loop right now. What we do from one end to what Montauk penetrated in the past, to what we do to where Montauk penetrated in the future, is now fixed, because it's fed back on itself. It's now a fixed... yeah, it's fixed. Right now. Had to be because of that. It had to be fixed." Note the HUGE difference here in the two versions. Valerian has discarded most of the information, and boiled it down to one answer. The equivalent section of the video, however, confusingly answers the question both ways, with additional context. Now if we examine this video from the perspective of characters and their philosophical beliefs, we can tell at this point that the idea of time being fixed is coming from Nichols, who speaks with authority even though he is just surmising, and doing it without benefit of the model of decisions branching out into alternate universes. In other words, he's observed some evidence and then jumps to a conclusion, as most of us would. Plus, if they use a tape to synthesize the vortex function, naturally they'll connect to the same version of time that the visualizing psychic originally thought of, so they're ability to see multiple versions would be somewhat limited. Can we make any better sense of what they witnessed? It could be that their set-up could only materialize the remote end of the vortex on the one timeline that they had charted, and they never really thought to plot another one, either intentionally or through oversights in temporal theory. What they can't stop however, is natural human behaviour choosing its way onto different paths of history, which the remote end of the vortex may be following during a specific mission. End the mission and start a new one, and perhaps they were back to the original old one they first started with. If you do dig deeper into some of the specific futures that these individuals claim to have witnessed, it seems that humanity has since chosen significantly different paths - better ones I think. This is to be expected and frankly celebrated. We have choices. And we're learning to make better ones. Preston Nichols, as of November 1989, didn't seem to be aware of the solution of looking at his evidence of time travel through the theory that every decision branches out onto a new line of time, and very much interprets all of the results on a single time-line that is either changed, or unchanged. By 1995, in his third book "Pyramids of Montauk", he has got to the point of being convinced that there must be two timelines. We should note that Nichols is an electrical engineer working on the project, not head of temporal research. He has simply seen stuff. Duncan Cameron, as of November 1989, may well be of a very different view. He is not the excited story-teller that Nichols is, and often seems to speak in the riddle-like terminology that reflects his training in precise, concentrated visualization of a space-time event, or function, where that is an object they intend to materialize (à la Star Trek's replicator), or a time-space vortex connecting to past or future or distant planet. I suspect that if Nichols wanted to say that time works in such and such a fashion, and Cameron completely disagreed, Cameron would not take Nichols on in a debate in front of audience and video recorder. That's my take on their character interaction. However, if they did state contradicting opinions, I'd be more inclined to believe Duncan Cameron than Preston Nichols. Cameron, in his role in how this project supposedly worked, is closer to the heart of the relationship between time, space, and choice. But of course, Valerian is crunching all their info together, making it impossible to distinguish the two. As I've mentioned before, by the time his document gets to the question "Any initial comments about electromagnetics?" we've pretty much reached the end of the Nichols/Bielek/Cameron video that I can use to corroborate Valerian, and the rest of the information is taken from other sources, whatever they may be. "The Navy had the ability to use the time travel technology from about 1970 and developed full operational capability in 1973. They did do an experiment where they tried to go back and kill the father of the man destined to be the head of the new One-World government. They did kill his father, but it made no difference. They didn't understand why it didn't work. Robert Lazar was voicing the concept that time is quantitized or compartmentalized and that you can't change what has already happened in terms of the past." I love that this bit would corroborate my theories of time, in a scenario reminiscent of "Day of the Daleks" (Doctor Who story no. 60). On the other hand, a few lines further down is a bit of info that appears to contradict it. Who said the contradiction? Is it Cameron, or Nichols, or Bielek, or none of the above? Perhaps I'll have to find more videos someday and dig through to find the source of these comments. But perhaps it doesn't matter. What seems ultimately undeniable, is that nothing can definitively tell you what to believe in. The choice is always inescapably yours. Fred Alan Wolf: "We're beginning to see that time itself is not sacrosanct. We're allowed now to get into it in a different way. David Deutch, Oxford Physics Professor, was, I think, one of the prime inventors of Quantum Computation, the Quantum computer, and he is very much into parallel universes and time travel. And says now all the paradoxes of time travel.... You can go backwards in time and knock off your father and mother before they have you, and come back, and you're still alive and, no paradox. And even to explain that is difficult to do but nevertheless, put them in a parallel universe and it's no problem. So these are the kinds of things we're doing in physics right now. We're re-thinking time." -speaking in the film "What the Bleep Do We Know - Down the Rabbit Hole Quantum Edition"
As fascinating as further information from Bielek, Nichols, and Cameron is, a word of warning: Most of it comes through their common filter of conspiracy theory, which can at times become a little too compelling and all-consuming. While it is definitely good for each person to learn to think for themselves, rather than let institutions or authority try to do it for them, the human mind ultimately does not function at its best while in a state of paranoia. If Philadelphia and Montauk say anything about the power of the mind to manifest itself outwardly, all the more reason to make our minds the best they can be, working in concert with heart and spirit. Evidence of Fourth Density Transformation? It is good to remember that the human race is evolving to a point of greater understanding, compassion, and wisdom, even if it is a bit dramatic as we have one big final fling with our issues. In that sense, remember that we are ALL evolving, including those who would sit at the top of such conspiracies, and we will attract contact with those who are of like-vibration as ourselves. Our political/economic systems and figureheads represent aspects of ourselves. As we evolve, either they do as well, or they will be forced to zig while we zag. What is the furthest anyone has traveled in the future? So everything is locked in until 10.000AD? Yes. It's a dreamlike reality. No one has picked up a tangible future beyond 2012 AD. There is a very abrupt wall there with nothing on the other side. Prophecies speak of earth changes around then. Audience: "What is the furthest forward that anyone has traveled, that you know of?" Preston Nichols: "Ten thousand [A.D.] ....Nobody's ever gotten that far into the future and gotten into a real almost like a running life situation, so we don't know what it is. As Duncan describes, it always appears to be like a dream-state where they hardly ever encounter any other people." Audience: "How far can you go and get a tangible real future? Or can you do that?" Nichols: "No one's gotten a tangible real future beyond 2012." Duncan Cameron: "2012, 13, 14...."
Nichols: "...14, somewhere in there." Audience: "Does that indicate that maybe things have changed so radically at that time that there isn't anything else to see?" Cameron: "There is a very abrupt wall there, with nothing on the other side." Audience: "The prophecies speak of the Earth changes at those times." Does it sound like conspiracy-minded time travelers are zigging, while the rest of the evolved Earth is zagging? There are several things to note here. The 2012 date is less precise than Valerian's version made it out to be, as Cameron hints at the existence of variables that could make certain events occur earlier or later. And Cameron basically resists official agreement with the audience when he says enigmatically "Curious, isn't it?" as though they may be on the right track, but they'll have to do their own research, because he isn't telling, nor sharing his own theories of spiritual evolution here. They'll have to make up their minds. Another thing to note here would be the consciousness and motivation of Earthly time travelers originating in the 1980's or earlier - still being so locked in third density that they are unable to perceive the fourth in the same way that people native to the time would be. Also, the perception of exploring a single line of time, which these groups seem to want to cling to, probably won't apply after the transformation to fourth density. It may not ever have applied, but pre-transformation one is permitted the luxury of evidence suggesting it does apply. Port-transformation, the evidence of fluidity of choice challenging one to accept a new paradigm is likely to be inescapable. For me, this is what the "wall" represents, a challenge to these time travelers to expand their definition of what reality is as much as those who are on the Earth after 2013 already have. Al Bielek: The rumors were that there were probably artifacts from an ancient civilization buried underground because there were a lot of remains above ground, ruined cities that have been there by NASA's estimates maybe 300,000 years, 250,000 years. But they found the entrances all blocked, all scaled off to any underground areas. So the word went back through communications (in the late 70's) to whomever back to the Montauk and Phoenix project, "Can you do anything about this for us? We can't get into the underground of Mars." They said, "Yes, I think we can. Give us some coordinates on the surface of the planet. We'll have to run astronomical computation." Which they did and plugged these all into the computer. They wanted two people to go and it happened to be Duncan and myself. Interviewer from The Sovereign Scribe: Why two? Al Bielek: To corroborate what the other one saw and also in case there were any problems in the underground. They didn't really know what was down there. So they sent us and we went up there in the underground. [Using the Montauk Time-Space "Tunnel" device, developed as a result of the Philadelphia Experiment. (See Scribe issues 9,13 and 14.)] There was a problem with light. We had to take lighting with us at the time. Later on, if I remember, we found some of their light sources and turned those on. We found eventually that the last remnants of the Martians, if you wish to call them that, died in the underground between 10 and 20,000 years ago by estimate, and they left everything they had of their civilization underground. We found enormous amounts of statuary which appeared to be religious. Sovereign Scribe: What did they look like? How big were they? Al Bielek: Typically 6,7,8 foot tall, stone, gems embedded in them and so forth. Sovereign Scribe: These were of human-like people? Al Bielek: Yes. They were quite well preserved. Then we found archives. We found a lot of scientific equipment. We found electronic equipment down there; tons and tons of stuff. And the rumor was also later that ... I didn't recall until Duncan reminded me of it about a week ago. he said, "Don't forget the 17,000 metric tons of Martian gold they took out." Al Bielek: "We have had a two-tiered technology for at least a century, perhaps longer, in that there are technological developments which have been withheld from the public and have been held in the hands of a controlling elite if you will for at least a century, perhaps a century and a half, because our technological base does go back to about 1800 or earlier. "And secondly, you have another problem called economic crack-up. If you were to release certain of these new developments too rapidly and too soon, you would totally disrupt our current economic base, which is based on fossil fuels, electric power generation going through wires and transformers and such, communications as we know them, jet aircraft as we know them, and chemical rockets to get us to the moon. All this is a base for our current industry and our current society and our current economy. You don't supersede this rapidly overnight, otherwise you can destroy the economic base. "I'm sure at some time it will be released, but it is not being released now, and that's one of the reasons. You don't play games with the basic economy. And furthermore, those who are benefiting from it in terms of gigantic profits like the oil companies are not about to give up their profits. That's only one example; I don't mean to single them out as being alone. They're not." It has been said that if we were to switch instantly to an economy such as what is reportedly in Gene Roddenberry's Star Trek where there was no money, and people could take any goods or request any service they wanted without having to pay for it, there would be mass hording, because we would fear we didn't deserve it, and would try to grab it all now while we still could. Don't you feel that would be true? Are you ready for the utopia you may dream about? Are you ready to let go of fear? Are we ready to live without secrets, or pre-judgment? There is much yet to be done here on Earth with our technology and our view of economy and currency. Many of our systems try to grow like mushrooms, and will be unsustainable long-term. Stable whole systems have yet to be implemented, particularly in banking and currency. Our article on Monetary Reform is a good place to start for learning about the difference and what we may need to look at and change. That done, the motivation for maintaining a two-tiered technology in our society will have lost one of its key factors, and beneficial change will be easier and quicker. An Article about the asymmetry of free electricity. A List of points that Bearden claims are true, revealing which scientific ideas have been suppressed or ignored, and what has taken their place.